Despite the hype that always accompanies the staging of an Apple event, only a handful of them over the past decade have truly mattered. It seems pretty clear that next Tuesday’s event is going to fall into that category, based on the way Apple has handled the run-up to it and the fact that we’re about to enter a new era for the storied company. You can count those ground-breaking events from the last ten years on one hand: the 2005 iPod nano event, the 2007 Macworld that introduced the iPhone, the 2008 event that revealed how the App Store would work, and the 2010 iPad event. Sure, there were other notable moments during that period (and plenty before then) but those were the events that truly made people realize how Apple was defining the current generation of personal computing. Tuesday’s event will be one of those crossroads events: one that we’ll remember either as a day [company]Apple[/company] articulated a new vision for computing that we’ve been waiting for someone to advance — or as a sign it has overreached. It looks as if the new product category that Apple watchers have been clamoring for since Tim Cook became CEO in 2011 is here, in the form of what we’ll call the iWatch. We don’t know what it looks like or exactly how it will work, but we know that it will pair with the iPhone and we know that it will serve as a landmark product for those who have wondered if Apple could sustain its amazing run of innovation as we approach the third anniversary of Jobs’ death. It sent out invitations to the media and other guests a week earlier than usual, and it even invited long-banned iPhone 4 wranglers Gizmodo. It will hold the event at the Flint Center for the Performing Arts on the campus of DeAnza College in Cupertino, the site of two landmark events in computing history: the unveiling of the original Macintosh in 1984 and the public return of Jobs with the iMac in 1998. It is constructing a huge building on the campus of this facility to house, well, something. It announced that it would be live streaming the event much earlier than usual, and has placed a countdown clock on its home page. “This event is uncharted territory,” said no less an Apple authority than Daring Fireball’s John Gruber this week. And it’s not just the above series of observations that leads to that conclusion. This event feels like the first event that is truly free of Jobs’ shadow, and that is a very healthy thing for Apple. Obviously, going back to the Flint Center can’t help but evoke the memory of Apple’s mercurial co-founder, but the products that will be unveiled on Tuesday were likely only glimmers in Jobs’ eye when he left us in 2011. The crucial decisions about components, features, pricing, and the like were entirely the product of a new management team assembled by CEO Tim Cook. It’s likely the first event of a new era in Apple’s history in which the company is no longer worried about beating the giants of the computing and consumer electronics worlds. If wearable computing is truly going to become the next big thing, Apple is setting its sights on competing with the fashion designers of the world, rather than the tech industry. Let’s face it: for all the recent emphasis on design among tech companies, they rarely produce truly fashionable items the way Louis Vuitton cranks out handbags or Italian shoemakers collect money from Om Malik. Just look at all the Android Wear smartwatches that have been produced to date: does anybody who cares about his or her appearance truly want to wear such a device? Apple edged in that direction with the original iPhone, but the design breakthrough then was really more about user experience than it was true fashion. The iWatch promises to be different — although no less focused on user experience — because the items you wear on your body are much more an expression of yourself than the items you carry in your pocket or purse. We at Gigaom have been preached the gospel of connectivity for years: that one day, everything will be connected to the internet, and that connection will create all kinds of magical and terrible things we can’t even envision yet. If we are really ready to embrace fashion accessories as mini computers, who would you bet on: one of the most iconic computer companies of all time, or a proud fashion designer who has never sourced a microcontroller? Just look at what Marc Newson decided to do on Friday: I’ll bet you an iWatch he’s seen the iWatch. Personally, I’m not convinced the world is ready for the iWatch the way the world was ready for the iPhone. Smartphones were common among the tech set before January 2007, but they become instantly clunky, slow, and one-dimensional in the wake of the iPhone. There has not been a comparable embrace of smartwatches that we know lack a certain je ne sais quoi at the same time we know they’ll one day be huge, although you could argue that the interest in fitness tracking devices like the Jawbone and the Fitbit (see disclosure) is the first wave of that movement. But the essential truth of the iPhone was that it awoke the everyday consumer to the possibilities afforded by the internet in their pockets. If the iWatch — or whatever it is called — can reveal the possibilities afforded by health-monitoring sensors, helpful notifications and perhaps something we haven’t yet realized we want, Apple will have made yet another breakthrough. And this time, you won’t be able to pin all the credit or blame on Steve Jobs. I’d bet that’s exactly how he would have wanted it. 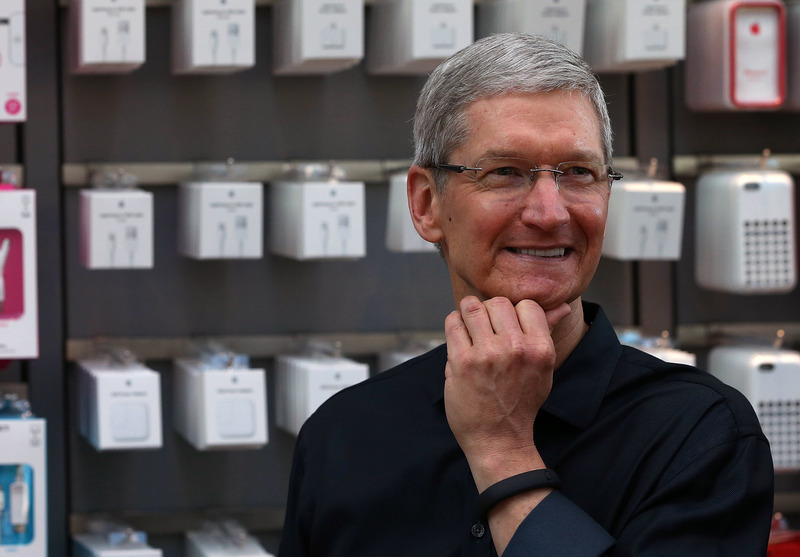 Tim Cook photo by Justin Sullivan/Getty Images. Disclosure: Fitbit is backed by True Ventures, a venture capital firm that is an investor in the parent company of Gigaom. -I’m pretty sure that word is ‘fnord’…amirite? Are you saying you won’t buy an Apple wearable that looks fashionable or you won’t buy wearables at all? It seems to me if a company is going to market a wearable, they need to make it fashionable and market it as such. Yes really.. Not competing with other tech companies but setting their sights on the fashion industry.. No thank you I want tech that is useful, not just pretty..
Really? Apple has always been a fashion company in addition to a tech company. Is trying to become a fashion company then I will transition back to PC and hop on the good ship android.. Hiding in plain sight is the Disney Magic Band, which I suspect has been studied carefully by Apple (Jobs was on the board, and this was in the works for many years I suspect). If Disney can make a go in a closed ecosystem, imagine what can happen if you have Visa, MC, Nordstrom, CVS lined up. I’m definitely looking forward to NFC mobile payments. Get rid of my damn Metrocards and most of my pocket cash. Apple is already on board with the stores that I frequent and I’m really into body sensors and health monitoring, so it’s very likely I’ll be buying the Apple wearable device but on the downside I probably won’t be happy with its battery life. It’s my understanding that Apple has invested quite a bit of resources and dollars on developing medical capabilities. Despite what jjj states, if Apple is able to integrate advanced medical sensors into the iWatch that, in conjunction with an iPhone 6 app, will play a key role in keeping me healthy and alive, I’ll buy it! Also, the integrated NFC functionality** with Apple’s strategic relationship with leading financial institutions and major retailers will be a watershed event, because it means that cash, for the most part, will become totally obsolete. Yep, next week’s announcements from Apple are going to be BIG. “Apple hasnâ€™t been shy about stoking the fires for its Tuesday event in Cupertino…. Seriously? You couldn’t get YOUR FIRST SENTENCE right? As you have acknowledged on Twitter, and as I wish you would have acknowledged here, the Flint Center for the Performing Arts is indeed located in Cupertino. Sorry Tom but the site gave me no indication my post had been unmoderated. You are correct. I apologized on Twitter and will do so here. I apologize to the writer and to Gigaom for my post. For some reason, I forgot the Flint Center was in Cupertino, not San Francisco. I’m sorry for the mistake and for my post. Ugh, hat’s a silly error. Fixed. Tim Cook is a great leader for Apple. There’s many people who brought Steve’s vision to life and many of them are still there. I have no doubt they’ll knock our socks off. Can’t wait to see what they have in store for us on September 9th. Watches will never be huge even if they have a life saving functionality and they end up selling 100 mil units a quarter. The max acceptable price is low and the ASP will drop bellow 50$ soon. Watches won’t replace phone ever, although glasses that are stored on the wrist when not on our nose can. Watches aren’t a big deal even if every single person on earth gets one. You seem to be stuck on fitness and notification just because the existing products are doing that but that’s far too little and it’s very easy to do a lot better. As for Tim Cook , they had a bunch of logistics problems since he took over and that was unexpected. They release unfinished products like Maps and the fingerprint sensor (was not actually used for much) and the first gen ipad mini was wrong specs and wrong price -they fixed that with the second gen but messed up at first ( most likely i said they should price it at 400$ with high end specs well before launch in some comments here). On the iphone front,they failed to go bigger long ago, they keep failing to get rid of the home button that is forcing a way bulky design that is far behind the times. The 5C was pointless, they are better off making an iphone Classic line with the traditional design and going for a new design with the main iphone (but they don’t see to have the courage for more than a mild evolution in design). Given all that expectations should be low. Even if the form factor is right ,even if the functionality is right , the price might not be , or it could be in beta or they could have huge delays. And then ,why even bother making a watch? there are bigger things to go after and easier ways to make money. Apple has few products ,they should focus on more important things. To me, if the iwatch looks like a watch, Cook needs to be fired, lots of mistakes already and this would be too big to let it go. Wow, you don’t sound like a Fandroid at all! Bah..Bah..Bah…Tim Cook is easily one of the best CEO’s in Tech. I would like to say that you should really be running your own company and that you would change the world. However, you’re probably just like every other armchair CEO who always thinks you can do better but really can’t do anything except criticize others. Apple is a rather wealthy company run by people who do a very good job of satisfying customers. Apple is far from perfect. No company is perfect. Apple makes mistakes like any other company and probably a lot less mistakes than other companies make. Cook isn’t going anywhere. I don’t know about Apple’s wearable products but Apple is certainly going to move 75-80 million iPhones and that’s a hell of a lot of revenue and profits. Consumers will be more than satisfied with those products and that’s important. Apple has few products so maybe they should come out with something the equivalent of Google Glass which is setting the world on fire… NOT. No matter what you think about Apple, it will continue to be a successful company and will be around for another five years at least. Bashing companies isn’t all that unusual but there are plenty of companies that should be bashed before reaching Apple. I’m certain Tim Cook will survive this event and many more. I don’t know if it will be anything special but as long as Apple doesn’t make a complete fool of itself, I believe Apple will continue to remain as a successful company with desirable products in the near future.